On January 2, the Indian elephant Ryuka wrote this year’s Chinese zodiac sign of the horse in kanji at the Okinawa Zoo & Museum. 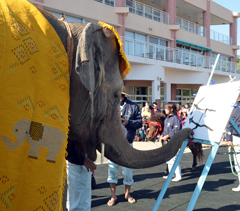 On January 2, the Indian elephant Ryuka tried kakizome or first calligraphy at the Okinawa Zoo & Museum. She wrote this year’s Chinese zodiac sign of Horse in kanji, holding a special customized brush for calligraphy with her trunk. In tribute to this year’s Chinese zodiac, the Yonaguni horse Dunan and Navie signed the works by Ryuka with their signature hoof prints in red color. The zoo gave the elephant and horse-signed works as New Year presents to the visitors born in the Horse year. Their kakizome will be displayed at the special exhibition gallery until the end of this month.